It’s springtime, which means it’s time to get back on your bike! Here are ten of my favorite bike accessories for utility, safety, and style. Got some bike projects to share? Post ’em up in the comments! These city biker hip huggers are designed by Philadelphia crafters Fabric Horse. The “Halfbelt” holds a phone, (lady-sized) wallet, keys, and a multitool easily. Also available with more storage or as a U-lock holster only. They’re also going to be part of the Bazaar Bizarre at Maker Faire Bay Area this year, yay! Ever wanted your bike wheel to light up with bright, psychedelic-colored patterns as you ride? Me too. 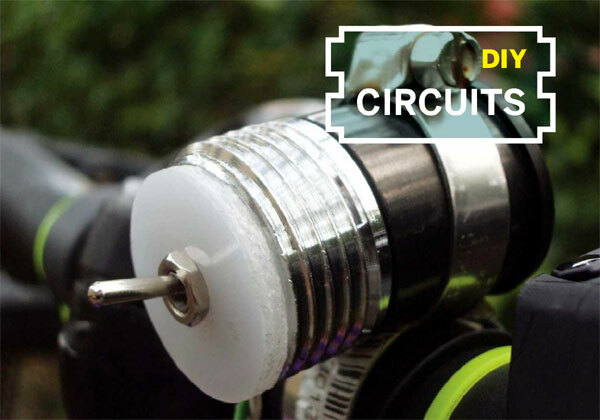 MonkeyLectric makes a persistance-of-vision (POV) device that does just that. I get compliments on mine all the time! Adafruit also makes a (programmable, open source) POV bike wheel accessory, called SpokePOV. It’s only a single color, but uses a hall effect sensor to keep the design (which you create) upright while you ride. Yes, I did just use two animated GIFs in a row. Learn to make this blinky bike patch using a LilyPad Arduino in this CRAFT Video! You need your fingers for using your brakes, but it’s still a bit chilly to ride! Try knitting up your own fingerless mitts with this free CRAFT pattern. Not a knitter? These are fast to make; I’m sure a crafty friend would love to make them for you! Oh, and that sweet bass (pictured) was made by Joe Kruse. Let those behind you know just how fast you’re going! It’s a project in MAKE Volume 19. 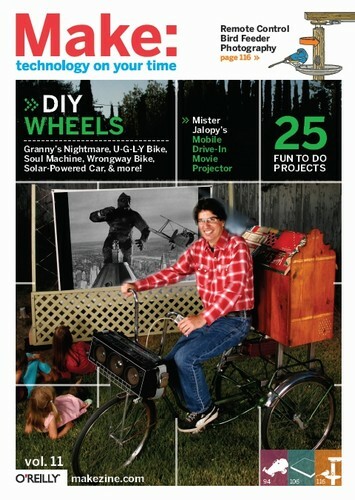 Check out the DIY Wheels section in MAKE Volume 11 for bike projects like Mr. Jalopy’s mobile drive-in theater, a pedal-powered iPod charger, and more! Subscribers can read it now in the Digital Edition. Learn to make this mini bike light in this article by Trevor Shannon. Kip also whipped this one up in one of his Weekend Projects videos.